Before & After - I had to share! I had to share this... We have Chica trimmed from time to time - otherwise her hair just gets so scraggly and dirty from running in the yard. Yesterday was a trim day. I took her down to PetSmart and ordered her usual grooming. 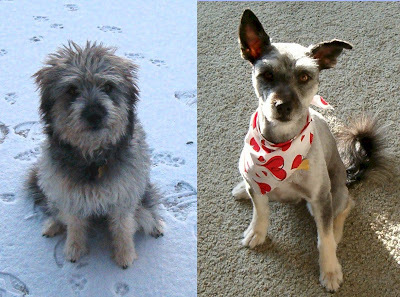 Here is a before and after that will help you understand why we laugh at her for 2 or 3 days after her haircut. It's like a totally different dog.